Shim-pack Solar C18 and C8 columns are packed with high purity silica gel with a high degree of inertness. The silica gel has higher surface area and fully end-capped with good hydrophobic retention, low absorption of ionic compounds and good peak shapes. Highly uniform particles ensure stable mobile phase delivery and low pressure. 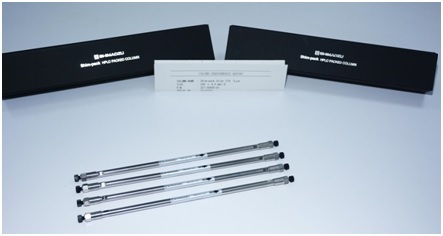 The Shim-pack Solar LC columns have a wide pH range of 2 to 9 and are highly suited for a diverse range of compounds .